Every so often you come across a tool that ticks all of the boxes. In the kitchen I love my Joseph® Triscale. In the car it’s my GPS which not only gets my family from A to B, but has also probably saved my marriage multiple times. Working with students, it’s the Whisper Phone. 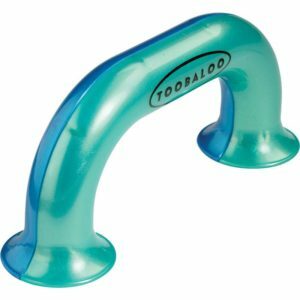 This literacy tool is a fabulous way for a child to receive valuable auditory feedback, particularly when they are learning to read.It helps keep the child focussed by cutting down on distractions like background noise and raising the volume of their own voice which is delivering the information. In the area of literacy and particularly for teachers and parents wanting to engage in phonemic awareness activities, the children are better able to hear, recognise and distinguish the sounds in words. 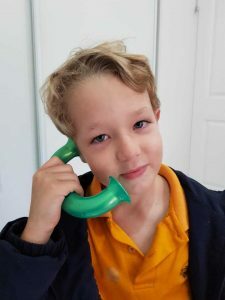 This fun phone is designed to be used intuitively by very young children and is perfect for the early childhood setting. Ask the child to pick up the phone and say their name. Can they say their name in a high voice? Can they say their name in a deep voice? Model it for them if they are unsure. What other ways can they say their name? Can the child break their name into separate sounds? For example: T-o-m. Or if the child doesn’t have an easy name like this you can try m-u-m or d-a-d to begin with. 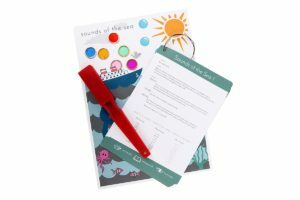 If you are an RWR Community Member use your Sounds of the Sea Activity Card 1 and use the word list to let the child practise making the sounds in the phone. After they have heard individual sounds in the phone, ask the child to push the sounds together and say the word. If a child is having difficulty with a particular sound, you can use the Whisper Phone as part of your toolkit for more focussed practice. For example, for the p sound, place a piece of light fabric like a scarf on top of the child’s head hanging over their mouth and tell them you’re going to teach them a magic trick. Choose a p word as your ‘magic word’. When they say the p sound correctly, the scarf should magically lift up and slightly away from their face. Alternate with the f sound where the scarf will stay in position. Then ask them to say a group of other ‘magic’ p words into the phone and build on from there. Whisper Phones otherwise known as Toobaloos are available from Sensory Oasis for Kids, Fishpond or if you’re crafty, you can make a D.I.Y version here. Check out other great products that can help develop literacy skills in a fun and playful way.